SL25 - Rigid Heddle Sampleit Loom 25cm/10"
Home » Ashford Weaving Looms » Rigid Heddle Looms and Accessories » SL25 - Rigid Heddle Sampleit Loom 25cm/10"
Ashford's Sampleit Loom is 25cm (10") wide, and has a built in second heddle kit. Inexpensive, compact and cute without sacrificing function. 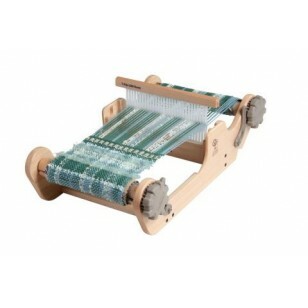 The 25cm (10") weaving width allows you to sample all your favourite rigid heddle patterns, textures and colours.